Pianist Gila Goldstein who is known as a versatile performer, has captivated audiences around the world with her unique artistry and soulful interpretations. A sought-after teacher, she serves on the piano faculties at Boston University’s School of Music, the Boston University Tanglewood Institute and the New York University’s Steinhardt School’s Department of Music and Performing Arts. She has given master classes and adjudicated international and national piano competitions throughout the USA, in Israel, China, the Philippines and Korea. 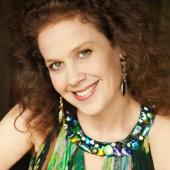 Ms. Goldstein has performed as a solo artist and a collaborative pianist throughout the United States, Canada, Mexico, Asia, Europe and Israel. Her most notable performances included the Israel Symphony Orchestra Rishon LeZion, Jerusalem Symphony Orchestra, the Philippine Philharmonic Orchestra, Orquesta Da Camera in Mexico City and the Lincoln Symphony in Nebraska, as well as recitals and concerts at Lincoln Center and Merkin Hall in New York City, Progetto Martha Argerich in Lugano, Beijing Concert Hall, China, Seoul National University in Korea, the Purcell Room at the South Bank Center in London, Konzerthaus in Berlin, Musée de Louvre and Cité des Arts in Paris, Roy Thomson Hall in Toronto, Kennedy Center in Washington DC, Colburn Music Academy in Los Angeles, Old First Church and Temple Emanu-El in San Francisco, Gardner Museum in Boston, Dame Myra Hess concert series, Ravinia’s “Rising Stars” Series and Symphony Hall in Chicago, ”Great Performances“ series in St. Louis, Israel’s Henry Crown Hall in Jerusalem and the Tel Aviv Museum, among others. A Board member of the American Liszt Society (ALS) and the Founder-President of its NY/NJ Chapter since 1992, she has been a frequent guest performer at the ALS annual festivals around the USA and Canada. A champion of the music of Israel's leading composer Paul Ben-Haim in the past two decades as a performer and recording artist, Ms. Goldstein has recorded two volumes of his entire piano and chamber works on the Centaur label. Among the rave reviews the recordings have received worldwide, the American Record Guide wrote: ”Goldstein is a charismatic performer who plays with great flair, delicate nuances, fluid tempi and brilliance”. PIANIST magazine in London wrote: “Goldstein has a technique as fierce and fiery as the color of her hair”. These recordings mark a significant addition to the commercial releases of Israeli classical music as well as to the worldwide collection of recordings of 20th century piano music. Gila Goldstein obtained her music degrees in piano performance from the Manhattan School of Music where she studied with Prof. Nina Svetlanova and the Tel-Aviv University's School of Music, where her teacher was Prof. Victor Derevianko.